The network is for passing packets between two points in a complex network graph. Everything else is done in the application and networkers need to become application aware. Virtual machines and virtual switches are in a stage of change and confusion but ultimately will converge on a single method of configuration and usage. Is it possible to map OpenFlow to Tag Based networks. In a world of point solutions, the network could be used to organise these service chains. But long term the applications will self-organise and part of the development process. Are there too many virtual switching platforms and how will the market shake out. The impacts of IOT on networking and application selection. Great episode Greg. Very enlightening! The network evolution discussed seems very much like the “End to End” principle – one of the original bedrocks of Internet design (https://en.wikipedia.org/wiki/End-to-end_principle). Many thanks for making this podcast available. Which makes sense, source is a PhD COMPUTER SCIENTIST, not someone who ended up in IT secondarily. 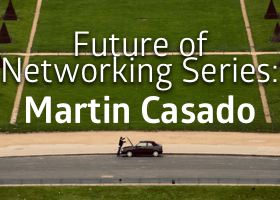 He looks at network as what it is fundamentally, not as products and vendors. Onward to the past. Great show. Thank you both.